In recent years, WordPress has gained a lot of fans and users. Because of its popularity, it comes as no surprise to see the number of WordPress themes, both free and premium, explode. Although it sounds like good news to a web designer, the vast number of options to choose from can be quite a headache. It’s hard to know which theme works best for you and the project you’re working on. There are a great number of reasons why premium is much better than free when it comes to WordPress themes. The most obvious reasons are that premium themes are built with a greater emphasis on power and flexibility. If you’re looking for free WordPress themes, take a look at this fantastic collection, and if you’re looking for the best WordPress Plugins, here are the Top 100 for 2017. Without further ado, here are the collection of the best WordPress themes for 2018! The X Theme is one of the most beautiful WordPress themes in the market. Although it is one of the most expensive themes, it makes up for its truckload of features that gives any seasoned designer a lot of tools and features to play upon and even an amateur designer create a unique website. 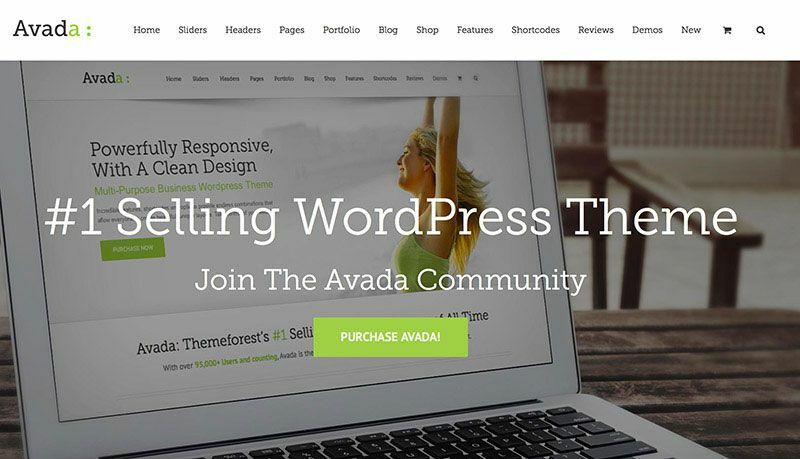 Avada is ThemeForest’s best-selling WordPress theme which has more than a 100,000 purchases. It comes with various web design tools which do not require any coding knowledge. Compatible with most popular browsers, it has unlimited designs allowing you to create different websites uniquely. 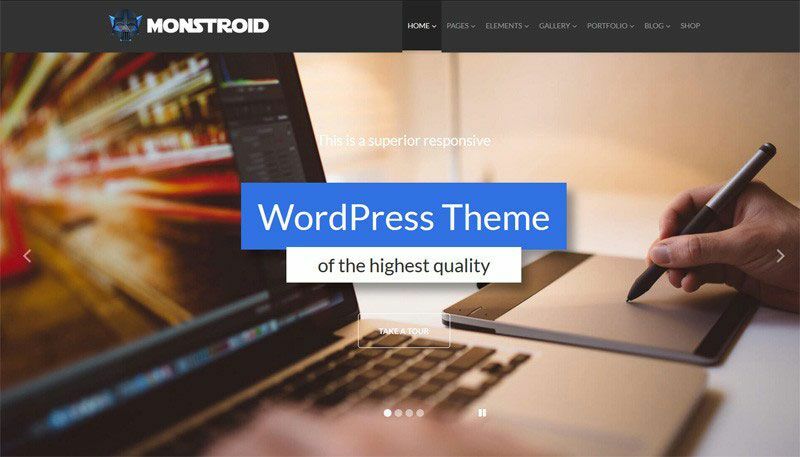 Monstroid is a multipurpose theme developed by TemplateMonster. It is also one of the newest themes in the collection. It was released in the summer of 2015 and the number of downloads for this theme has already exceeded 3,000. It would be wrong to call Monstroid just another modern theme as it offers really unlimited possibilities to its owners. Actually, Monstroid incorporates an entire toolkit for each and every web development need. Monstroid is suitable for both expert developers and amateurs. If you are not too keen on coding, you will still be able to build the website you wish. QODE is the genius behind Bridge theme, a powerful and flexible multi-purpose theme with more than 64 ready-to-use demos. So even if you are a newbie and have no idea about codes, you can still build your own website in a few hours with just one click. Bridge users have chosen it for a number of reasons, such as the nice layouts, code quality, feature availability, flexibility, documentation, and customization possibilities. The best come-on of the Bridge Theme, however, is its customer support. Salient is developed by ThemeNectar and is one of the best-selling WordPress themes on ThemeForest because of its visually enhanced features. One of its features include the video background support which allows you to add videos instead of only images. The main concept of this theme is to display every part of the website on homepage using custom sections, supported by custom design and multiple columns. The7 is a retina-ready multi-purpose and of of the best responsive themes that fits any site size. It is fully SEO-optimized and loaded with premium plugins. Designed by the Dream Theme, The 7 theme, has more than 21,000 sales since its release in 2013. Thanks to its scalability, performance, responsiveness, and its ability to fit into either big or small site, whether it’s a personal site or corporate portal. The 7 theme is compatible with WordPress 4.1 and has two available styles to choose from – iOS or the clean minimalist. You can choose from its 128 professional designs which can be used out of the boxed or can be fully customized if you want to stamp your personal style on it. You can further tinker with it easily using the Visual Builder where you can play with any layout you want in just a few simple clicks. The BeTheme touts itself as the most versatile theme with an extensive number of layout options, portfolios, blogs, and 200+ shortcodes. Built by the Muffin Group, the BeTheme is a dynamic theme which constantly grows as evident on the features it offers. The One Click installation feature is the Be Theme’s secret weapon which allows you to choose and install any of its 88 pre-made layouts. With this extensive layout library, there is something for any type of website, whether it is a personal portfolio, a cooking blog, or even an online store. The Jupiter is a theme developed by Artbees. It has a combination of different layouts, header styles, post types, and advanced content importers which allows more freedom and control. The Jupiter has just released its version 4 with more features and updates, such as the mega menu widgets and backgrounds, unique headers and logos for each page, animated columns, and 7 unique blog styles. These are just a few from the numerous features added by Artbees, the Jupiter Theme developer. If you have a limited portfolio but looking to create an online presence, the Brooklyn will be perfect for you. It is one of, if not the most, popular one-page responsive themes. Despite being a one-page website, it contains features that are dynamic and professional looking. Whether it is a personal site or for an organization, Brooklyn can pull it off for you. Inspired by eCommerce design, Flatsome is awesome flat theme that works with WooCommerce shopping cart. It focuses on those who want a minimal website where they can showcase their products or services beautifully. Stockholm, as the name suggests, has Swedish roots. This theme reflects its origin with its attention to details and lots of white spaces. The theme has 20 demos where you can see different design examples of what’s possible. Being a 100% fully responsive site, Stockholm and all its elements are ready for different types of devices. BuildPress is a great WP theme designed for construction companies and businesses. Being a construction company itself, BuildPress Inc. has worked with various construction companies worldwide. Total is a responsive multi-purpose theme with a front-end drag & drop builder. Some themes might have a certain niche in mind but Total is designed for various niches and professions. With this in mind, the theme is packed with an extensive portfolio and other awesome features, such as WooCommerce integration. Listify has a directory theme but with a beautiful layout and and fantastic functionality. It is built with directories and listings in mind. This is also a theme where you can charge when you add or make a listing, view a listing, make a reservation, book an appointment, or access the site. Florence is a classic theme loaded with a variety of post options, solid coding, and general theme options. Its cohesive and airy presentation, the theme has Solo Pine customer support behind it. The Newspaper theme was designed with the publication industry high standards in mind and it’s an excellent choice for any news, magazine or review website. Newspaper is built to handle large amounts of traffic without compromising on page loading speed. This theme has a modern and flexible design and it comes with nine unique stacks, called demos, you can choose from. It includes multiple custom built features intended to expand and improve the capabilities of your website. Newspaper has an intelligent ad system, video support and is fully integrated with plugins like bbPress Forum, BuddyPress and WooCommerce. Using the best SEO practices, this theme also has an great support service with extended documentation, narrated video tutorials and friendly support team. Story is a clean and flexible WordPress theme with great features, like full screen slider, custom headers and custom background sections. Story provides optimal viewing experience and will make your website look great on across wide range of devices and screen sizes with its parallax animation and responsive design. Osmosis is a multi-purpose theme which has the same backend and frontend UX. Packed with superior aesthetics, it also has awesome options and features for different types of websites. Aperio is a clean and flexible theme loaded with multiple header layouts, parallax slider, posts slider, revolution slider , powerful admin panel , and 600+ Google fonts. So whatever type of website you want to create, Aperio has the appropriate tools and layouts to make your website unique and standout among others. Sprout is also a theme designed for the publication niche. It is fully responsive and adaptable features for mobile phones, tablets, and desktops. Powerful Admin Panel, TiePage Builder, One-Click Demo Import, Content Slideshows – these are just some of the features TieLabs offer in their Sahifa theme. Sahifa is especially designed for online magazines, blogs, and newspapers as well as different kinds of platforms and devices. It is loaded with some of the latest features and plugins. The Newsmag theme is a good choice if you need to create and publish a lot of blog posts regularly. Newsmag could also be used as newspaper, magazine, review or publishing site. It is available in six unique styles which can be loaded with just a click. It is fully customizable, just in case you want to change the layout, fonts, colors, or other elements of your page. Since it is especially designed for digital publishing, it supports YouTube videos and has a rating system where your readers can rate your posts. It also has a responsive Google Ads and AdSense where each ad spot has a designated box to input your ad code. Each theme has been designed with a certain niche on mind, and SEO WP is not different. As the name suggests, SEO WP is designed for SEO and Social Media specialists and their clients as well as digital marketing agencies.Fully customizable, this Drag and Drop theme has a super quick live appearance customization. It also contains unlimited header styles, page designs,and footer layouts. Lumbermandesigns also added the Live Composer page builder where you can make and edit pages in the front-end by dragging and dropping the items. Since it is designed for best SEO practices, the theme is loaded with the top-selling set of 55 SEO services and web designer icons. In the latest update, Version #1.0.2, the Construction Theme has a One Click Theme Update feature which allows you to update in your WP dashboard by entering your ThemeForest Username and ThemeForest Secret API key in Theme Options setting field. KLEO is a dynamic theme developed by SeventhQueen. It is one of ThemeForest’s best selling themes with more than 4,000 sales since its release last year. It has also undergone various updates with the latest version includes features, such as Buddy Press Profile cover, Visual Composer, and WooCommerce Ready. It alsohas an awesome fully customizable portfolio which allows you to change your portfolio page with different appearance styles using portfolio shortcodes. KLEO was designed with the entrepreneur in mind because most of its features allows you to set up your business home page with ease. Aside from being WooCommerce Ready, it is also has Paid Membership Pros which smoothly integrates PayPal Express for business accounts and Paypal’s Website Payments Pro with the recurring payment module, Stripe, and Authorize.net with ARB. KLEO uses the Drag and Drop feature which allows you to build your page even if you have no or limited coding or HTML skills. There are many WordPress themes that are geared towards the construction business. What makes the Constructo stand out is the simplicity and ease of set up. Its features have been designed to help even the most inexperienced to create a professional website to promote your business. Constructo backs up its claim by having features, like One Click Demo install, Visual Composer, Revolution Slider and an Advanced Admin Panel where you can change your layout, colors, and fonts with just one click. The developers of the theme also included a free PSD file, video tutorials, and documentation to walk you through the set up. Above all, Anps offers free support just in case you encounter some new issues and problems. Impreza is one of the highest rated themes in ThemeForest containing the Top 3 popular plugins from CodeCanyon. The theme is also well-spoken and has received expert reviews from top Web authorities. Even the developers of Impreza is also well-known of and were chosen to be one of the speakers at the jQuery Conference in 2013. Oshin is a modern and powerful theme developed by BrandExponents. It has a striking balance between functionality and beautiful design which can be seen in each of their 12 unique demos. Oshin uses a powerful custom drag and drop page builder with features, such as copy and paste, that makes website building super fast. In terms of options and other features, Oshin has different layouts which you can combine together to create your own unique personal website. It also comes with a very comprehensive options panel containing 500 Google fonts and fine colors. Oshin takes the game higher with backgrounds because it enables you to create video backgrounds instead of just images. WPLMS is an e-Learning theme designed for course management as well as instructor and student management. If you are into the education business, it is the ideal theme to promote and sell your courses online. The theme transforms your setup into an LMS, utilizing the potential of WordPress, BuddyPress, BBPress, and WooCommerce. WPLMS is compatible with TinCan/XAPI specifications and a lot of popular plugins such as WP Coauthors plus, MyCred points system, BadgeOS, and PMPro. WPLS contains eight custom plugins which are specifically designed to enhance the learning experience. Exclusive features include the Instructor’s Dashboard where you can place your news, to-do list, schedules, and course statistics; Student Dashboard which displays your course progress, course assignments, online friends, and recent activity; Front End Course Creation where you can edit and create courses, quizzes, and set the pricing; and more which helps it easier for instructors and students to monitor everything in just one place. Real Homes is geared towards the real estate industry and has been the choice of more than 6,000 users. Its responsive layout was built in Twitter bootstrap with a full width slider. The Visual Composer is already part of the package when you purchase the theme allowing you to build custom layout pages with ease and speed. Since it is geared towards the real estate industry, the theme has features that help businesses in this industry. Some of these noteworthy elements allow user log-in and registration as well as a submission form which allows you to submit and publish properties. Real Homes is compatible with the dsIDXpress plugin and comes with a widget for easy searches. WooPress is designed with online retailers in mind. Those who used it have praised the theme for its customizability, flexibility, and customer support. Available in 7 different theme versions, you can have a One Page website if you have a limited portfolio, a boxed or full-width theme, and more. It is a clean and direct-to-the-point theme which showcases your goods and products attractively across different devices or platforms. WooPress is regularly updated with the latest eCommerce trends and can handle all of the technical stuff for you. You will find here all the elements a premium theme has: Revolution Slideshow, Page Builder, 8theme ShortCodes and widgets. The basic package of the theme includes advanced Admin Panel, unlimited headers, footers, breadcrumbs, and colors as well as different files to make customization easier. ROSA is a parallax theme aimed at restaurant and food websites. Rosa is equipped with features, such as parallax scrolling and full-screen images, and typography animations which let you present your products and story in a dynamic and enjoyable way. It also has menus, OpenTable reservations or galleries within a single integrated interface in just a few clicks. It is also WooCommerce ready for those who want to sell their items online. The ROSA theme developers gave careful attention not only to image and design quality, but also to the speed. The theme has a 98% score in the Live Demo page speed grade. In addition, it also has a live preview feature which lets you easily change the fonts, colors or layout sizes and everything will be reflected back to you. Automotive is a website template which has a well-designed inventory management system which will help you easily setup and customize your vehicle inventory. It also has a completely customizable, filterable, and sortable Inventory Search to search your Vehicle Listings, as well as a complete Inventory Management System and Loan Calculator. It also enables customers to quickly filter out vehicles that don’t fit their search criteria, displaying only vehicles that are perfectly suited to them. It also includes a layout for 2, 3, and 4 Vehicle Listing Comparisons, full Blog and tons of other pages and 32 page layouts. The Automotive has both the WordPress and PSD versions of the theme including a 32 pixel-perfect fully layered Photoshop files using the latest Bootstrap 3 responsive column layout. In its latest version, the Automotive Theme has CSV / XML File Import, enhanced SEO, unlimited sidebars, and a One Click installer. 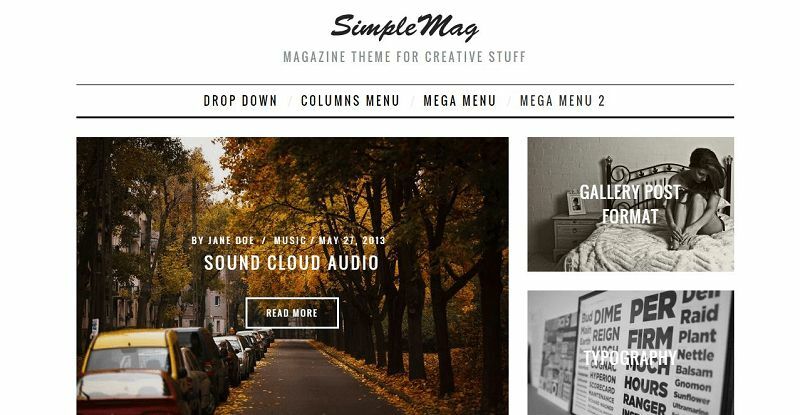 SimpleMag is another great theme for bloggers designed with the publishing industry in mind. Despite this, however, SimpleMag has its own unique features which make it a class on its own. SimpleMag has a QR code which can be scanned using your mobile devices. It also has an off-canvas menu which you can access by sliding the menu from the left and a smart footer which automatically adjusts itself based on the quantity of used sidebars. True to its name, SimpleMag is a simple and easy-to-use, available in four layouts and a configurable drop down menu which allows your readers to see the latest post from each category. 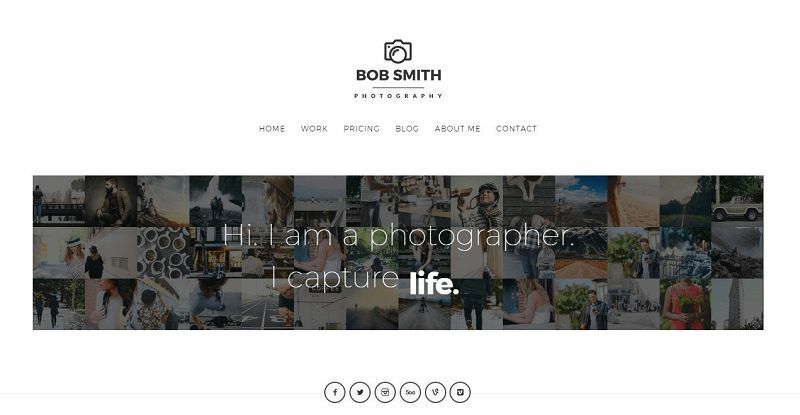 Photographer is a simple and minimalist theme designed to showcase your portfolio. Some call it one of the best themes for photographers and for a good reason! Photographer has only 2 layouts designed with a lot of space to focus more on your works. Its Live Photowall Homepage where visitors can see a different random unique homepage generated from the different images in your portfolio. It also has a zoomable image feature for the optimal image viewing experience. The images are flexible and the video can be embedded in various aspect ratios. The theme is easy-to-use allowing you to create galleries using the WordPress built-in galleries. It also has customized widgets from various photo and video social networking sites, like Flickr, Instagram, Picasa, YouTube, and more. Zephyr is another theme designed by UpSolution, the group which has created Impreza and two other popular themes in the market. Zephyr is their latest offering and is a combination of these three other themes where most, if not all, best features are taken. Zephyr has the basic features, such as being responsive and Retina-ready, One Click installation, Drag and Drop Page Builder, and WooCommerce Ready. There are also free features included in the basic package, like Slider Revolution plugin allowing you to add slides that will correspond the overall theme design. It also supports horizontal parallax backgrounds depending on the cursor movement. What more, you can easily add parallax background to every page section. Zephyr is a theme with vast options. Its portfolio has more than 6,000 combinations including category filters, pre-built demos, and hover effects. Its blog and image gallery meanwhile has more than 1,000 and 40 combinations respectively. uDesign is one of the best selling themes on ThemeForest with more than 40,000 sales. uDesign can be used effectively for users with no programming background as well as advanced developers. It will help you build your site in no time to your liking with minimal effort. It empowers you to set any color to elements such as backgrounds, links, text, menu links, and more. WP Residence is a clean and user-friendly design with features geared towards the real estate industry. Although specifically designed for real estate agents and agencies, it also allows other people to submit their properties for free, for a fee or based on a monthly subscription. Other options that are helpful for the real estate business are Properties Advanced Search with custom fields and dynamic search URL, admin-managed Google Maps with property location markers, Ajax Filters for Properties list, user log-in and register with white labeled dashboard with no WordPress reference, front end property submit & edit, and payment integration with PayPal and Stripe for CC Payments. Hemlock is a simple, minimal theme designed by Solo Pine. It has a straightforward functionality which makes your blog look sophisticated and modern as it stands out from the rest. The developers had simplicity in mind; thus, the peripheral elements has been trimmed away to remove distracting clutter. In place of this is a one column theme for any blogger in different niches. Shopkeeper is a design with a flexible framework allowing you to create any niche-specific website even without any coding experience. The theme was built with the needs of developers and consultants putting together websites for their clients in mind. Shopkeeper allows you to create sites for a wide range of industries and styles: online stores, product catalogs, blogs, portfolios, or corporate sites. Clean and minimalist, Shopkeeper has a wide range of customization features which lets you easily change the styles to fit your brand’s needs. You can upload your logo, change fonts and colors, build custom layouts, all through the admin interface without having to code a thing. In addition, it has a flexible header which can be adjusted according to your needs. And since it is an eCommerce theme, it has been built for WooCommerce helping you sell anything online, shippable goods, virtual or digital files. Elegance is one of the newest themes on ThemeForest. Having been only created in February 2015, it already has more than a hundred sales to date thanks to its seamless design and layout with lots of room for customization. Although the theme is aimed mainly for blogging, it can also be customized to create websites for various niches. Elegance is a mobile-first theme which means the designers prioritized the mobile context when creating user experience. It also means that the design has incorporated the newer technologies available in the industry. Some of the noteworthy features of the Elegance theme include 5 Hero Banners to choose from, Infinite Post Scroll widget which allows you to infinitely load posts on the sidebar, an Ad Manager to let you insert ads easily in your site, and comprehensive theme options. Bodega is another newcomer theme on ThemeForest making its debut in February 2015. Despite being new, it is not behind in terms of design, flexibility, and customizability. The theme has 30 demos, each of which has been crafted with attention to details and a specific business in mind. So if no matter what niche or business you have, Bodega has something to offer. The theme has innovative features as well, such as the SVG animations which allow you to animate the stroke paths of your own custom-made graphics, mask effects over your graphics in the theme sliders, and the Passepartout frame option which creates an attractive frame around your whole website. Pond is a minimal, yet creative theme geared for any type of website. With Pond, you have the option to create a One Page website for those with limited portfolio or a Multi-Page one for bigger and established businesses. One feature that works well with the One-Page option is its unique vertical orientation with a nice hover action while its video and parallax background are sure to make your website stand out. Alaska is probably the best theme for hosting sites with WHMCS Bopostrap Template and WHMCS integration. With the WHMCS-Bridge plugin, you will be able to create a fully responsive website. Some of its basic features include the Drag and Drop Builder, a Mega Menu to help you create space for a heavy content website and navigation. It also has a Video & Parallax Backgrounds For Visual Composer to help you create background section parallax including video background parallax. Since it is geared for web hosting sites, other features included are added to serve the purpose. For example, it is easy to add Google analytics. It also has Social list bar as well as contact bar at the top to help visitors and clients easily contact you. Alaska is also loaded with custom short codes, such as domain search form with custom URL short code, elegant professional pricing table short code, and beautiful Funfact short code. If you are creating a job listing website, Jobify is the theme for you. The theme is equipped with simple live filter and search features to help people find relevant jobs easily. It also has a fully customizable homepage which allows you to control the layout of your homepage. With Jobify, you will be able to easily monitor and approve job listing submissions. Jobify has the latest features including the Resume Manager, which allows employers, recruiters and prospects can find key phrases in resumes. Ausart is a fully responsive website for different types of users and organizations who want to showcase their portfolio. Built on the KODDE Framework V2, Ausart has a lot of new options and Page Builder V2 with drag and drop and resizable blocks. With these features, you are able to create complex layouts. Ausart also XML files and page builder dummy data to make it easy for you to setup and work. In terms of ease of set-up, there are also a lot of short codes included which can be accessed using a button in editor and a Shortcode Builder. To ensure that you set up the theme correctly, 10 video tutorials and extensive documentation are also included in the core package. The Javo is a listing and directory theme based on the Visual Composer Drag and Drop which allows you to build a website easily in just a matter of minutes. It also has 4 front-end forms, namely the My Items form, User Profile, Reviews form, Ratings Form, and Event Form – all of which has pictures and images. Its Lister features include by Location, by Categories, or both making it easier for visitors to search what they are looking for. Brixton is another minimalist theme with a clean and modern design. The theme has a trendy hipster combined with pure elegance. Designed by a small group of designers, Brixton has no unnecessary Slideshows and animations, just the information that you need. Even all your social media widgets are covered with no extra hassle. Brixton has just released a hipster trend design for barbers and hairstylists. They are also developing a feminine theme which will be released soon. The theme has 7 post templates which includes standard, video, audio, gallery, and blog. So that’s it for now, these are the best premium themes there are in 2016. Hope you found what you were looking for here. Now you just have to take the next step to creating awesome and functional website design for yourself or your client!